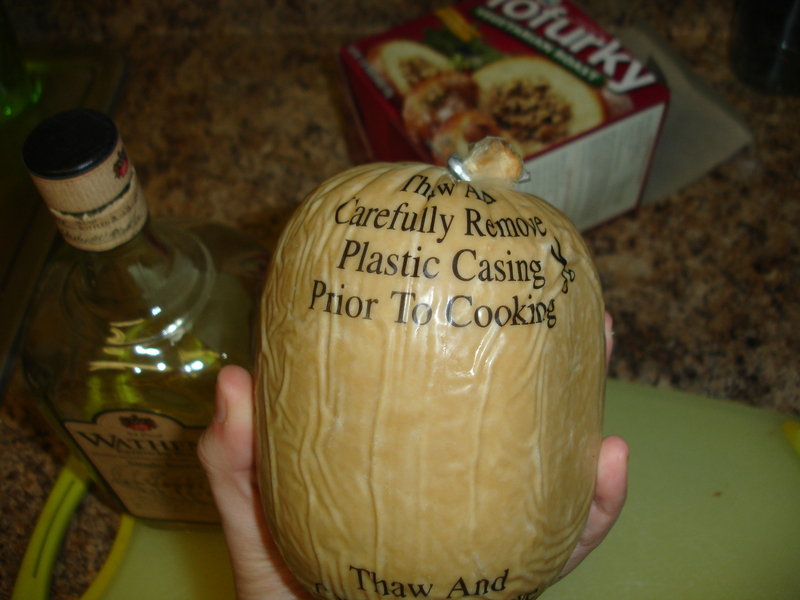 Mysteries of the Tofurkey: UNVEILED! As I have mentioned a hundred million times both here and on twitter, I had big plans to make a tofurkey as part of the Christmas dinner I was doing for my visiting family. Why have I mentioned this so many times? 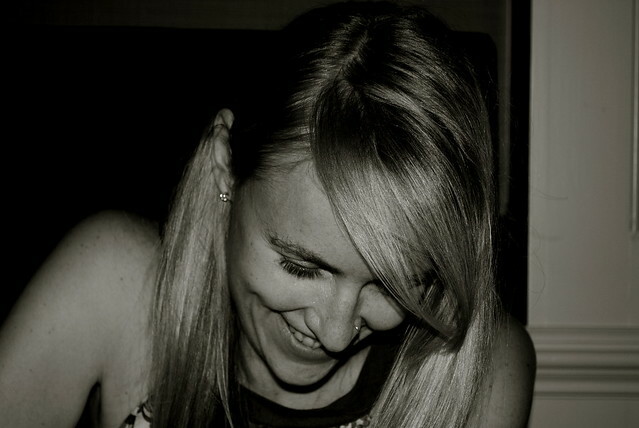 Why will I not simply shut up about it? Well, just think about it! First of all, this involves the word “tofurkey,” which is incredibly fun to say. I want to work that word into my life as much as possible. TOFURKEY. Second of all, I have never made nor eaten one of these strange plant-based “birds” before, so the mysteries of this tofurkey loomed large in my imaginings. What would it be like? Look like? More importantly, taste like? Could I prepare it properly? Would my family eat it? To learn the answers to these and other important tofurkey related questions, read on. 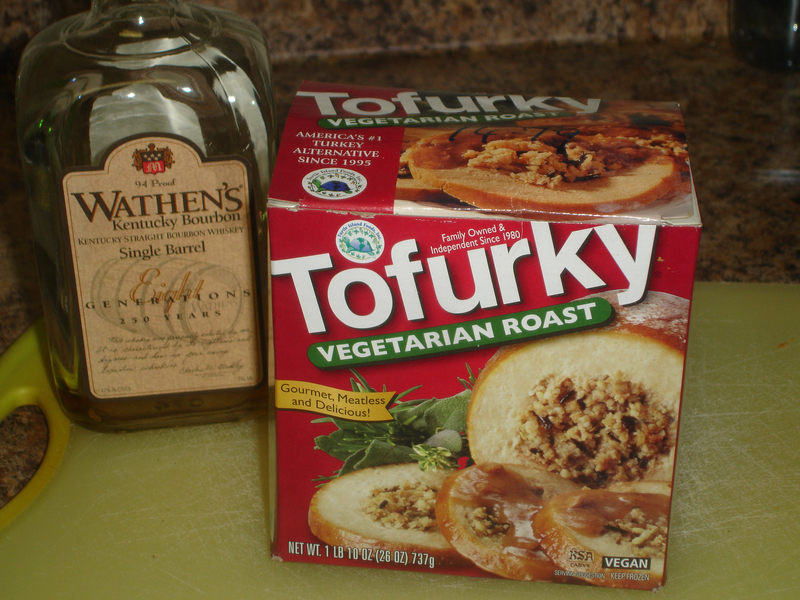 First of all, I learned that while “tofurkey” is a non-trademarked catch-all term for meatless turkey substitutes, Tofurky (TM) is the brand name of this specific food item, made in Hood River, Oregon. Holla, Hood River! I like your style! I pulled out this nearly empty bottle of bourbon to aid me in my cookery adventures — just in case it was needed. Who knows, right? Things could get weird. First step: read instructions. 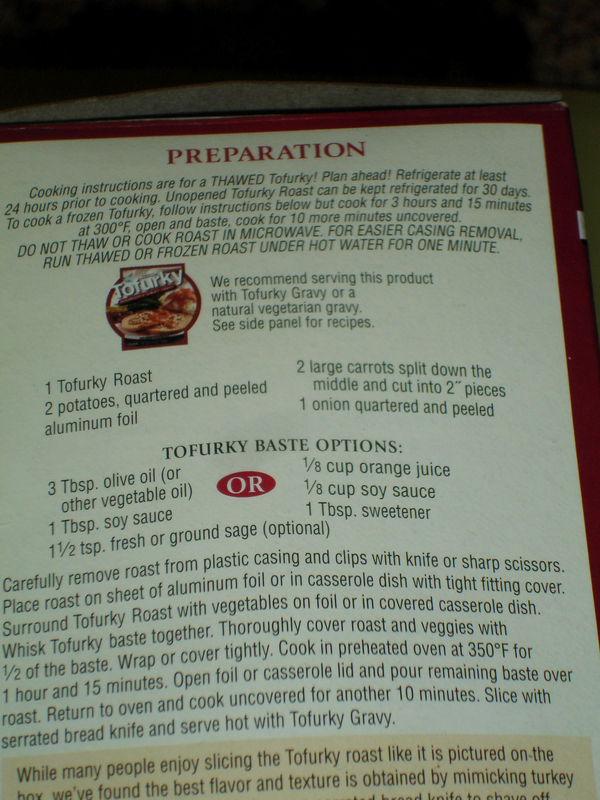 As you may be able to read below, the first line says, “Cooking instructions are for a THAWED Tofurky! Plan ahead!” So, basically these Tofurky-brand people have no patience for those of us who might forget to thaw our fake bird in time to cook it. Well, never fear, I had PLANNED AHEAD! The bird was thawed and ready to go. More stern instructions and, well, a not-so-promising blob of vaguely turkey-toned substance wrapped in a plastic casing. I should also note that this thing is approximately the size of a small coconut and cost me $14.79 + tax at my neighborhood natural foods shop. Is that an appropriate price? I can’t really tell anymore. Moving on. 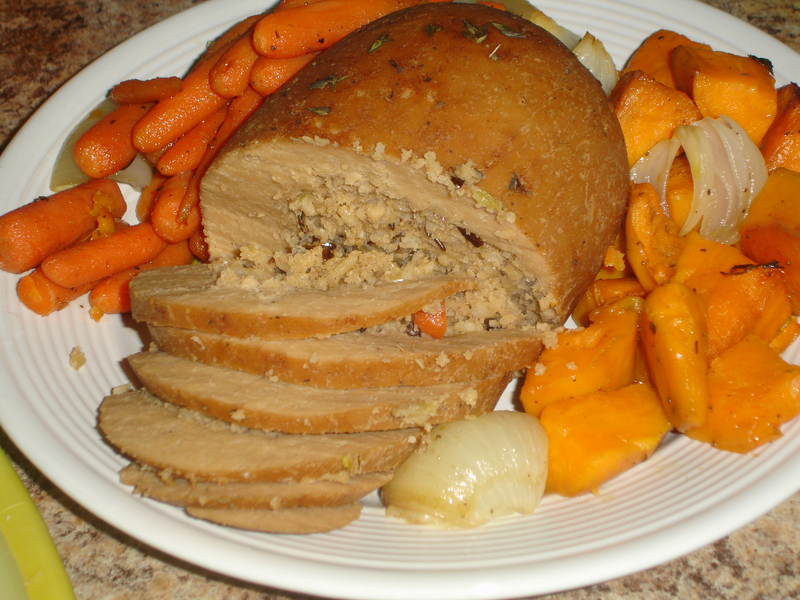 I followed the basting instructions, plopped the tofurkey into a roasting dish along with some sweet potatoes, carrots, onions, and parts of a clementine. Things still did not look promising, did they? 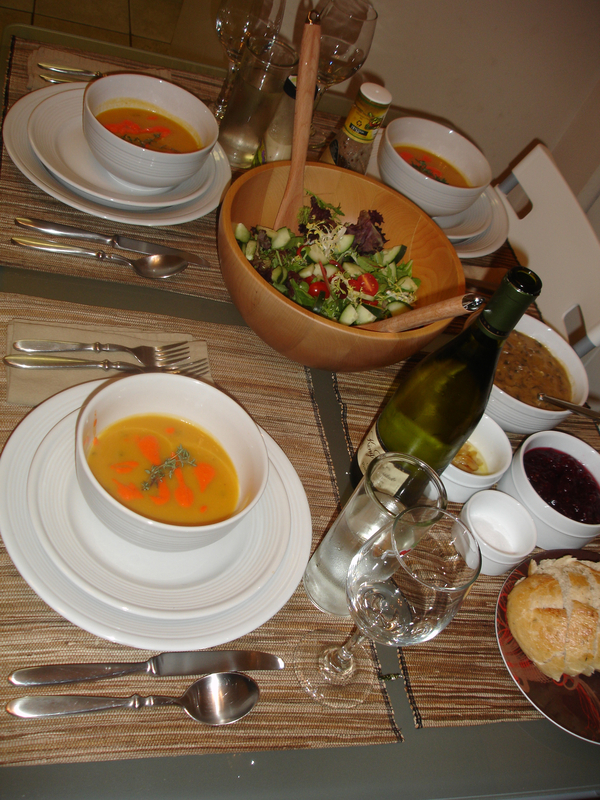 I made butternut squash soup — the same one I made for Thanksgiving — and it was awesome, as expected. I really love that recipe (found here). It’s easy and it looks far more impressive than it should. Also: salad, rosemary bread with roasted garlic to spread on it, wine. Gotta get the guys all happy and full of wine before the tofurkey comes out, I thought. Then maybe they won’t notice if it is terrible. Right? Well, here’s what the tofurkey and veggies looked like out of the oven. 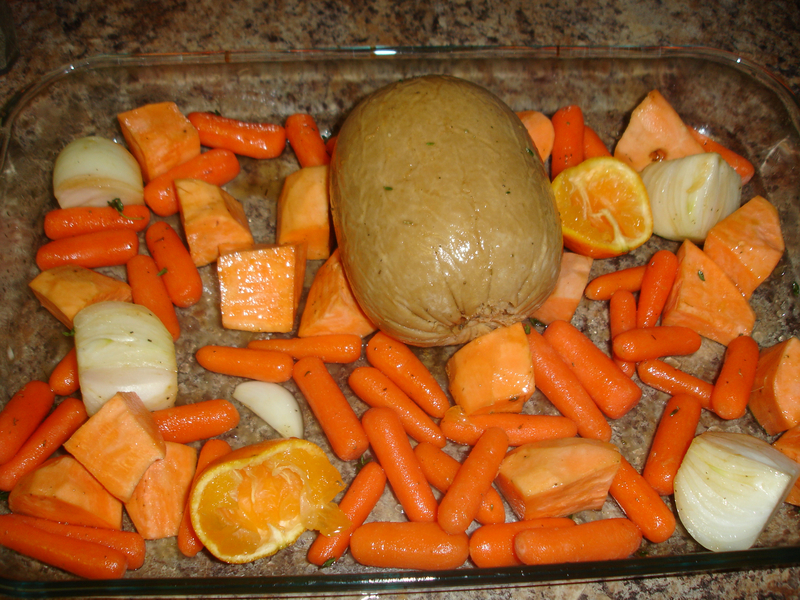 The carrots and potatoes look great, but, well, the tofurkey still looks like a strange, round, definitely un-turkey-like blob. Okay then. But then, something magical happened when we sliced into it and the slices all fell over in a line just like they should and the stuffing spilled tantalizingly out of it’s fake-bird container. It smelled great, and even looked generally all right. Nicely browned on the outside, tender on the inside. 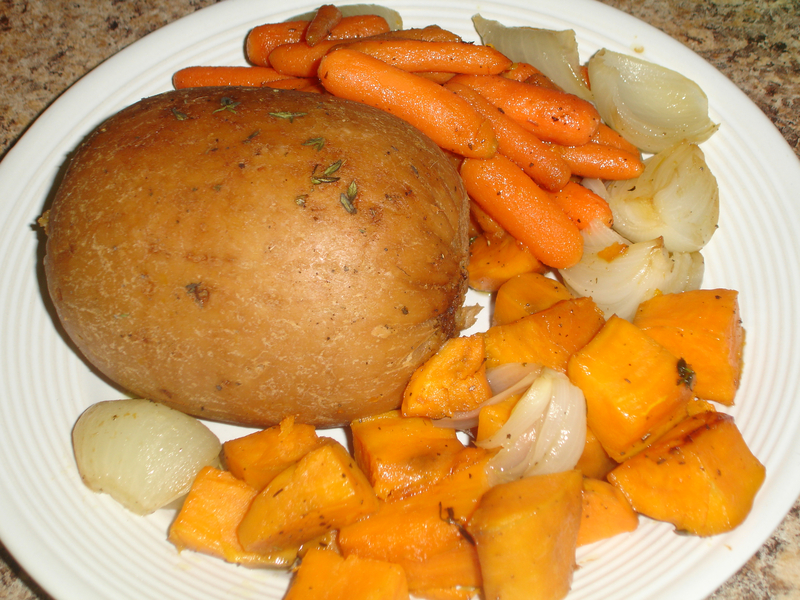 And basically everything looks nice alongside sweet potatoes, in my opinion. A sweet potato can do no wrong and if it chooses to associate with some fake-turkey dinner made out of magic and science, well, that’s fine by me. 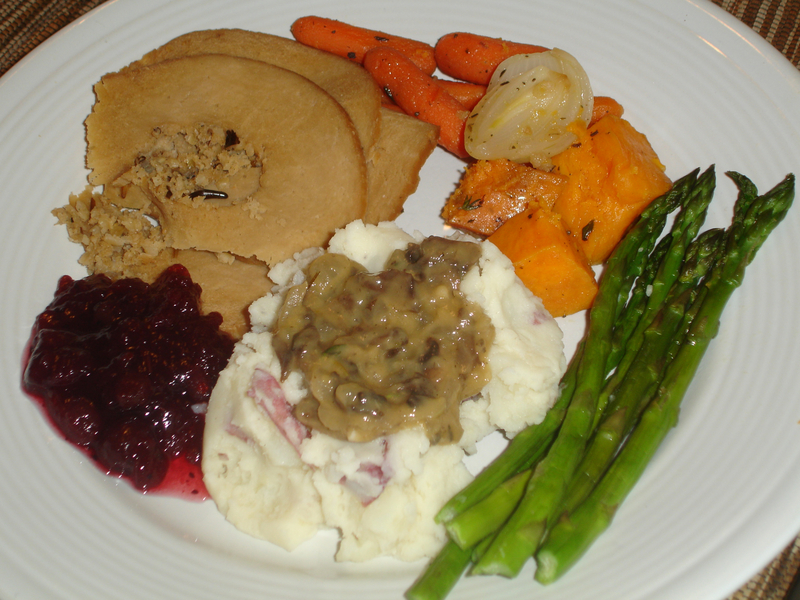 Also pictured: mashed potatoes with mushroom gravy, roast asparagus, cranberry sauce. It was approximately four times more food than I should have eaten, but it was all delicious and Christmas, so I don’t care. I am also bound to tell you that my dad and brother both went back for seconds and thirds, getting more tofurkey each time, and thereby redeeming the fake meat through over consumption. Victory was mine! Oops. 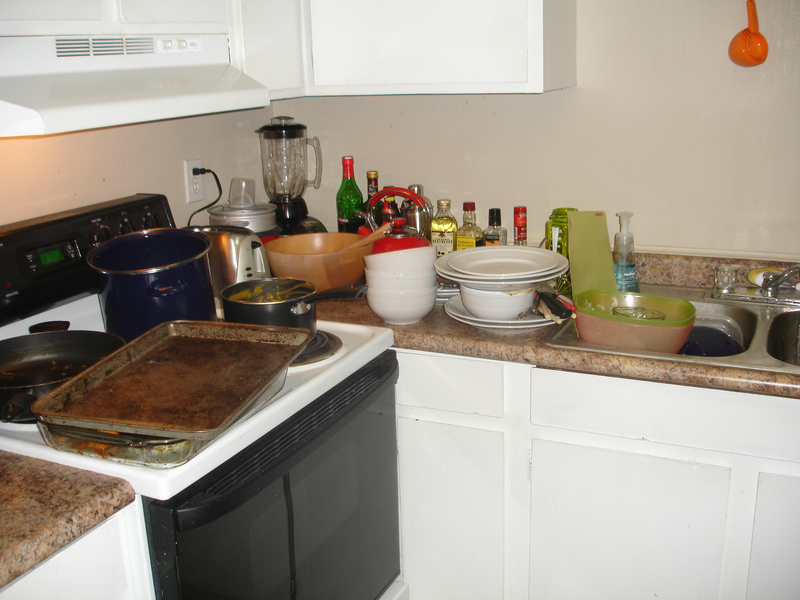 It was kind of a horrible mess in here, and I think there may still be traces of butternut squash soup spattered everywhere due to a blender mishap, but I did not care. Why? Because I was stuffed with tofurkey and wine. That’s why. I declare operation tofurkey a success! It’s definitely not something that will become part of my regular cooking repertoire, but if you are vegetarian and have omnivores coming over for a holiday-dinner-type scenario, it’s definitely a solid option. I will, however, be eating leftovers for approximately ever. Previous Article My Tree is Lit; My Tofurkey is Thawing. Now Bring Me a Soy Nog and Don't Hold the Brandy! Hey, Merry Christmas. Finally found the time to visit your new website. Hope everything is going swell at your end. At this end, I have rediscovered the Manhattan and learned how to laugh at the winter driving of the local natives of Luxury Land. I’m about to sit down for some turkey (sorry, it’s a real one) and indulge in some mashed potatoes and cheesecake with raspberry coulis for dessert. If I don’t make it out of the food coma, then best wishes for the new year. Merry Christmas to you, too! Sounds like you’re in for a great holiday calorie influx there. Also, I keep forgetting to check whether I have any comments to approve over here. Once you have one approved, if you keep entering the same name/email combo, it should automatically approve them. Sorry for the nuisance! Doing my bit to continue a baseless MSM rumour, didn’t George Bush serve plastic tofurkey to vegetarian pacifist soldiers in the middle east? Hmm, I haven’t heard that one myself. I’m a bit suspicious of GWB involving himself with tofurkey at all, which seems unlikely. I’m also a bit suspicious of the existence of pacifist soldiers. I can’t confirm this one!